I wonder who will launch it? India may be cheaper in this respect. ISRO has experience in designing Dual band SAR. It has designed one for Chandrayaan-2 mission. Since the 2007 National Academy of Science “Decadal Survey” report “Earth Science and Applications from Space: National Imperatives for the Next Decade and Beyond,” the National Aeronautics and Space Administration (NASA) has been studying concepts for a Synthetic Aperture Radar (SAR) mission to determine Earth change in three disciplines – ecosystems, solid earth, and cryospheric sciences. One of the most promising and original concepts involves an innovative international partnership between NASA and the Indian Space Research Organization (ISRO). Previous NASA concepts had focused on exploiting an L-band array-fed reflector SAR configuration that enabled > 200 km swath at full SAR resolution and full polarimetry simultaneously in order to meet requirements in all three disciplines. The electronics in this design are relatively compact, allowing for straightforward addition of feed array elements at other frequencies. As the partnership concept with ISRO developed, it became clear that flying dual L- and S-band SAR capabilities, with L-band electronics supplied by NASA and S-band electronics by ISRO, would satisfy science and application requirements of the US and India. A dual-frequency fully polarimetric SAR with the potential for global coverage every 12 days would offer unprecedented capability that researchers could exploit in new and exciting ways. The joint NASA/ISRO science requirements being formulated for ecosystems cover biomass disturbance, agriculture, wetlands and coastal processes, alpine vegetation, and high-resolution soil moisture. The two wavelength system has a number of advantages, including extending the sensitivity of biomass change and regrowth measurements to lower levels of biomass, improved classification of vegetation types, and possibilities for improved vegetation structure estimates, as well as mitigation of ionospheric effects. This poster will provide an overview of the conceptual system and highlight some of the anticipated science products. From the drawing board to the review room: Indian Space Research Organisation (Isro) and US' National Aeronautics and Space Administration (Nasa), who were in talks to co-develop a dual frequency synthetic aperture radar late last year. Now, the talks have converted into a project, with Nasa even having cleared Isro's instrument design. The project, which Nasa terms Nasa-Isro Synthetic Aperture Radar (Nisar) will use advanced imaging that will provide an unprecedented, detailed view of the earth. "It is being designed to observe and take measurements of some of the planet's most complex processes, including ecosystem disturbances, ice-sheet collapse, and natural hazards such as earthquakes, tsunamis, volcanoes and landslides," Nasa's Jet Propulsion Laboratory has said. This was just after the initial mission concept review was done on October 15-16, 2013. On March 19, 2014, the project passed the crucial Key Decision Point-A (KDP-A) review, which, is an important stage in Nasa's Exploration Systems Mission Directorate's project life cycle module. Following this, the agency will begin reviewing the critical design review, systems integration and operational readiness. Subsequent to this, on March 27, 2014, Isro's instrument design passed Nasa's review, which sources said, is another level of acceptability and a sign that the project's a 'go ahead'. That presentation showed GSLV-II as the launch vehicle. Yes. GSLV Mk2 seems to be launch vehicle. NISAR slide mentions that the spacecraft will be based on I3k bus. That looks within range of what current GSLV MK2 can launch (attached slide) to SSPO. Some modification might/might not be required to cryogenic stage (current C12.8 to C15) as current GSLV mk2 uses stage 2 of 39.5 T propellant. I'd like to ask why NASA and ISRO have chosen this particular project to collaborate on. Is it for the purpose of harmonizing Synthetic Aperture Radar specifications between NASA and ISRO? I'm thinking that this is the reason, due to the past attempt at collaboration between ISRO's Chandrayaan-1 mission and NASA's Lunar Reconaissance Orbiter in the bi-static ice detection experiment. What might be the follow-on consequences of NASA-ISRO collaboration on NISAR? I'm thinking that there could be more missions in the future which will attempt to repeat such collaborative bi-static ice detection observations in other parts of the solar system. Harmonized specs on SAR would help to make such missions more successful. NISAR science workshop is planned to be organized at Space Applications Centre (ISRO), Ahmedabad during 17-18 November 2014 with the primary objectives of: informing and involving Indian applications community about NISAR mission; exploring new applications of dual-frequency SAR data; and searching for collaborative opportunities. A team of scientists from NASA / USA is likely to participate in the workshop. The workshop invites from the participants, new ideas and innovations on SAR applications for societal benefit. Interested participants will display a poster or make 5-minutes presentations showing new applications and innovative techniques for SAR data utilization. Selected ideas have a chance for being considered for support under NISAR Science programme. Meanwhile, SAC which is a part of the NISAR (NASA-ISRO SAR) mission – a joint project between NASA and ISRO – has completed the baseline design review of the payload that will help study the hazards and global environmental change. SRIHARIKOTA (AP): India and US have set a target of 2021 to put their collaborative earth observation satellite NISAR in orbit, ISRO Chairman A S Kiran Kumar said today. Indian Space Research Organisation (ISRO) was working with National Aeronautics and Space Administration (NASA) of the US to undertake the launch of NISAR by 2021, he told reporters here after the successful launch of GSAT-6 onboard GSLV-D6. 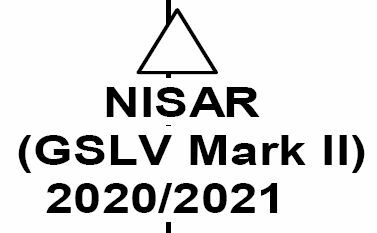 "One of the GSLV Mark II will carry NASA's satellite NISAR in 2021. There is a very good chance of commercial requirement. Currently we are working on it," he said. Isro Chairman confirms that GSLV-D6 Rocket will be used for launching ISRO-NASA mission. Here is the report from the Hindu. Answering a query, a senior ISRO scientist said that using India’s GSLV and not going for space agencies abroad for launching satellites weighing up to 2 tonne would help save on foreign exchange. GSLV will cost just one third of the cost we have to spend on foreign agencies, he said. A senior official said that there were about 10 Indian satellites which were lined up to be launched on board GSLV -D6. The NASA Jet Propulsion Laboratory (JPL) announced their selection of Astro Aerospace, a Northrop Grumman Corporation (NYSE:NOC) company, to design and manufacture the radar antenna for its NASA-ISRO Synthetic Aperture Radar (NISAR) satellite. On Monday, some of the NASA scientists will be visiting Gujarat Science City for a special outreach programme with students. “A team of seven scientists from NASA’s Jet Propulsion Laboratory and three others from ISRO will be visiting us. They will be largely be talking about the NISAR mission to about 200-odd science and engineering students,” said Narottam Sahoo, advisor and member secretary at Gujarat Council of Science and Technology (GUJCOST) which is organising the event along with Gujarat Science City. Scientists working on one of the biggest collaborative projects undertaken by ISRO and NASA will take the project a step ahead today by kicking off the radar flight testing of NISAR (NASA-ISRO Synthetic Aperture Radar). A special aircraft landed at the city airport on Tuesday to carry the radars developed at the Space Application Centre’s (SAC) Ahmedabad facility for initial testing. It should be noted that the SAC developed radar will be tested in Ahmedabad’s sky for three months. As per sources, the radar developed by SAC will be fixed on a Beechcraft Super King B 200 — owned by ISRO — for the first flight primarily to ‘understand weather and geographical conditions’ to continue testing further. NISAR mission is a dual frequency (L & S Band) Radar Imaging Satellite. Confirming the development, SAC Director Tapan Misra said, “We will test the radar by taking images from about 8km above sea level; the same area will be further studied by scientists from ground level to understand the radar’s accuracy level. “The flying is essentially to understand how the radar sees the crops,” said Misra. The data collection and observation will also scientists time to analyse and simulate data from the radar. The mission is schedule for a launch in 2020. Will NASA-ISRO satellite pass the Trump test? India's space agency, ISRO, and NASA of the US are working on the development of advanced space-based sensors and radar systems that can help sharpen earth observation applications in the future, according to Tapan Misra, Director of the Ahmedabad-based Satellite Application Centre (SAC). One of the focus areas of the joint venture called NISAR (NASA-ISRO Synthetic Aperture Radar) is making sensors in the L&S band. These can help in observations such as deformations in the land surface, details of the coastline and depths of the ocean, to aiding in disaster response. Misra made these observations while delivering a lecture organised by the Aeronautical Society of India (ASI) and the Sensors Research Society of India here on Friday. The NISAR project agreement signed between the two agencies aims to launch an earth monitoring satellite by 2021. The SAC will take the lead in the development of C-band radar imaging as well as in microwave and optical sensors, which have a big role to play in the future. The Indian Space Research Organisation is planning missions to gear itself to meet the growing demands for observational studies with multiple applications. In the quest to connect the benefit of space-based observations to the advantage of the common man, SAC has conceived and launched a spectrum of optical and microwave payloads. In the last two decades, the optical observation capability has improved from 35 m to 60 cm. Sensor technology has changed from electrical transducers to integrated chips & is visible to microwaves," he said. At present there are 13 operational Earth Observation (EO) satellites. SAC has built specific air-borne electro-optical sensors to meet the exclusive requirements of high resolution and hyper-spectral imaging from an aerial platform as well, Misra added. Isro sources claim that the NISAR satellite will be launched, hopefully, by 2020-21. Misra said that joint testing of NISAR’s two radar systems — the S-Band developed by Isro and the L-band radar developed by the US — will be conducted soon and the two technologies will be integrated. Former NASA administrator says that NASA-ISRO satellite is expected to be launched next year. On a billion dollar Isro-Nasa joint project to co-develop an earth observation satellite with synthetic aperture radars (NISAR mission) whose launch is expected next year, Bolden, a former astronaut, said, "The satellite will be the first radar imaging satellite to use dual frequencies. Nasa will provide L-band synthetic aperture radar while Isro will provide an S-band synthetic aperture radar. India is providing a particular sensor and a wavelength which we (US) don't have. Therefore the joint collaboration." Once launched, the NISAR satellite will help observe and take measurements of some of the planet's most complex processes, including ecosystem disturbances, ice-sheet collapse and natural hazards.